Though cultural planning is a relatively recent concept its contribution to urban planning and historic preservation is paramount. Many states, cities and smaller communities within the United States have turned to cultural planning and programming to aid revitalization and development, including arts and cultural districts, which serve as models of place-based ingenuity. These places serve as points of community engagement and economic development as well as support the cultural identities that strengthen business and tourism. Moreover, they are designed to encourage artists, entrepreneurs, institutions and potential developers to build upon and organize around existing arts and culture-based resources. Presently, existing literature discusses the role of the historic built environment and the creation of creative industries. Historic buildings often provide small, affordable spaces suitable for small businesses. Additionally, there is a substantial amount of literature stating the direct correlation between historic preservation and the overall economic growth of neighborhoods. However, no literature exists that explores the connection of arts and cultural districts and their historic built environments. This research aims to fill this literary gap and understand the role that historic built environments play in the vitality of arts and cultural districts. The study undergoes an intensive examination of a singular case study, the River North (RiNo) Art District in Denver, Colorado, through qualitative and quantitative analyses. 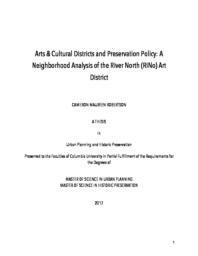 This thesis proves the economic value and visual appeal that these historic buildings have on the RiNo Art District, and provides recommendations that help to expand the preservation toolbox and facilitate an intersection between arts and cultural districts and the preservation field.